I’m two weeks (out of eight) into my internship with Sun Microsystems in Delhi, and have been using OpenOffice almost exclusively to create & edit documents during this period. Initially I had installed version 3.0 & last week upgraded to the latest 3.1 version. Feature wise, OpenOffice seems to be quite a useful alternative to MS Office, though it is not entirely compatible with the Office 2007 formats, particularly pptx. There have been a couple of features that I found lacking in the OpenOffice writer. The first was the lack of a proper citation/reference management tool like in Word 2007. The database based feature seemed a bit too complicated. As I was looking around on the OpenOffice wiki, I found a nifty Firefox based utility called Zotero. It allows the collection of reference sources on Firefox & these can later be inserted as references in Writer. It supports a number of citation formats & also allows one to insert a bibliography section that is synced with the main Firefox reference database. There is also a plugin for MS Word in addition to some other word processors. There seems to be one limitation with the reference tool though – it does not support inserting references in tables. Still, it is quite a useful tool to have. 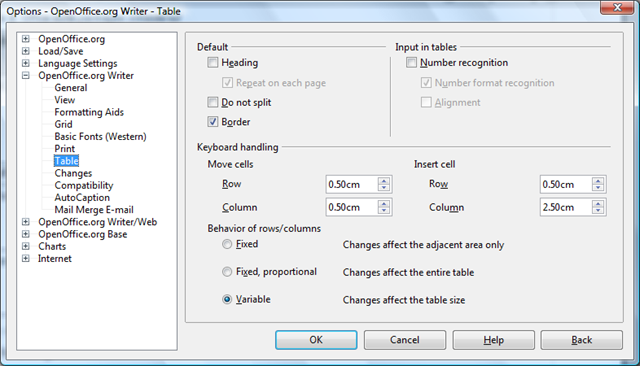 And, talking of tables in OpenOffice Writer, there is a feature turned on by default that seems to be more irritating than handy. This is the auto number formatting in table cells along the lines of a spreadsheet. I found this to be quite a problem when typing in numbers with decimal points (entering “3.0” would get converted to “3”) or date like numbers/phrases that got converted to a different format. This feature while quite handy in a spreadsheet caused me quite a lot of problems initially before I turned it off. Turning it off is quite simple. Just go to Tools->Options->OpenOffice.org Writer->Table and uncheck the “Number recognition” feature (I could have probably just unchecked the “Number format recognition”). I did the same under the OpenOffice.org Writer/Web section too, to be on the safer side.